The Tartankiwi: Dinosaurs it is then! The votes are in and it was pretty decisive. It would seem that the dinosaurs have won your hearts! Kristine, I will be in touch soon to find out if you would like me to make a triceratops, a brontosaurus or a t-rex for you. 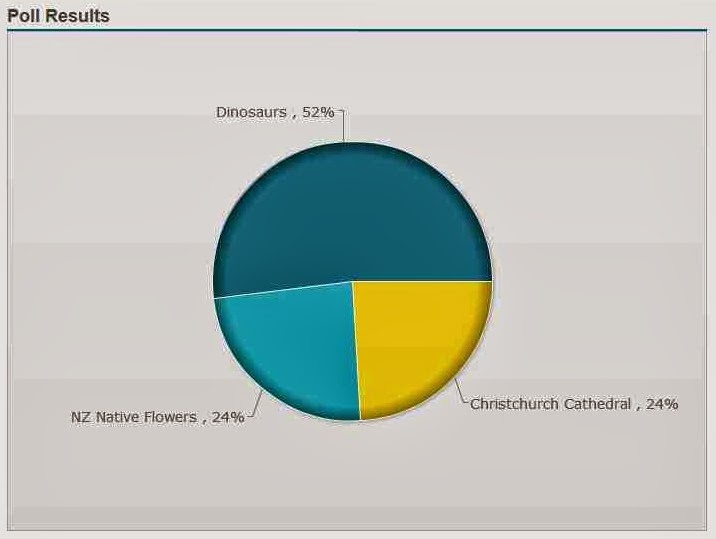 For all the rest of you, if your favourite was one of the NZ flowers or the cathedral, please do not fear. Some of the patterns are already with my testers, others will be soon. Thank you to everyone who contributed to this wee project- I don't know about you but I can't wait to see these dinosaurs made up! Whoop - cant wait to see it! Looking forward to seeing the dinosaurs but my heart is still with the flowers!! !